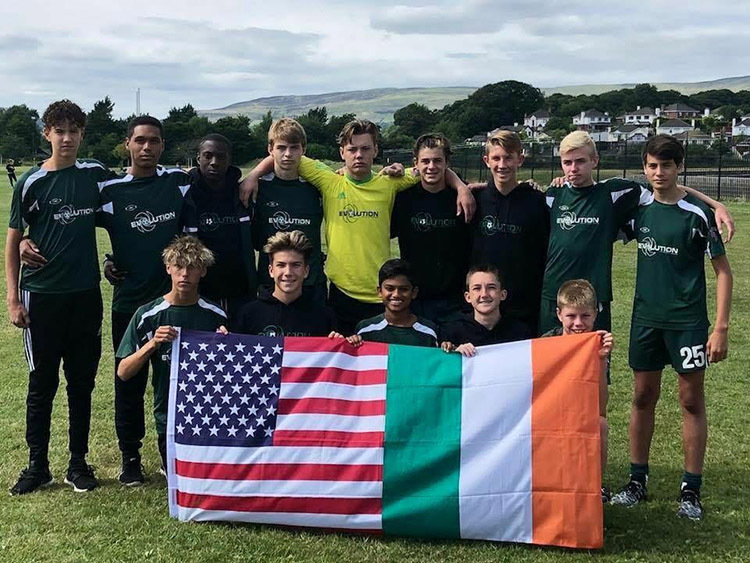 Cooleyville Evolution Soccer Club from Texas, USA travelled to Ireland last Sunday for the Foyle Cup Tournament in Derry with DB Sports Tours. Upon arrival at Dublin airport they were met by DB Sports Tours staff and transferred to The Inishowen Gateway Hotel for check in and an evening meal and relaxing before a visit to enjoy the breath-taking views of the Giants Causeway in Northern Ireland the following morning. After this Cooleyville Evolution played their 1st game on Irish soil in the Foyle Cup v Newbuildings United FC from Co.Derry where they won 8-0 which was an amazing start to the tournament from the young boys from Texas after which they returned to their hotel for another fabulous evening meal. On Tuesday (Day 3 of the tour) The boys took part in the official tournament parade through the streets of Derry before a walking tour of the surrounding area such as the Bogside in Derry and a walk along the river Foyle, later that evening the boys Kicked off their 2nd game in the Foyle Cup Tournament against Letterkenny Rovers from Co.Donegal at the Brandywell stadium home of Derry City FC but narrowly lost 1-0 to a very good Letterkenny Rovers side. Day 4 of the tour saw the guys from Cooleyville Evolution get a taste of Gaelic football the no.1 Irish sport before later that evening competing against Phoenix FC from Co.Dublin again at Derry City FC Stadium The Brandywell in their 3rd game at the Foyle Cup this game was tough for the guys from Texas as they were defeated 4-0 by the Dublin side who played some excellent football throughout. This meant that Cooleyville qualified for the Shield Section of the Foyle Cup where they would play 2 more games and compete to win that section of the tournament. Cooleyville were hurting from their loss to Phoenix FC but got back to winning ways on day 5 of their tour with an emphatic 4-0 win v St.James’ in their 4th and 2nd last game of the tournament, The following day Cooleyville faced their last opponents of the Foyle Cup in local side Derry Colts with the score being 1-1 before Cooleyville lost 4-2 on penalties to the local side. The experience for the young boys from Texas will no doubt go on to help them in their development as footballers. The memories that they made, the team bonding, the experience of playing against teams from a different country and playing against different styles will live long in the memory for players, coaches and even parents of this brilliant football club.